has this affected the people living under poverty in both countries? Do you have the latest stats? Anon: "has this affected the people living under poverty in both countries? Do you have the latest stats? " 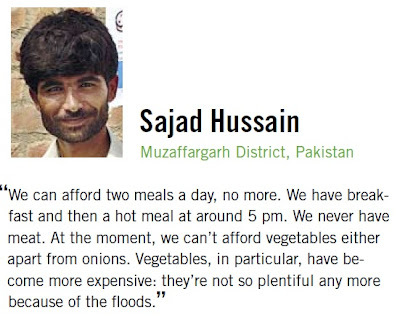 Double digit food price increases have obviously hurt the poor the most in South Asia because the poor in India and Pakistan spend more than half their income on food. The number of hungry people has dropped in India with its score on the Global Hunger Index improving to 63rd position in 2013, but the country still lags behind China, Pakistan, Bangladesh and Sri Lanka. The 2013 GHI says that in India the proportion of undernourished declined from about 21% of the population to 17.5%, the proportion of underweight children declined from 43.5% to about 40% and under-five mortality declined from 7.5% to about 6%. 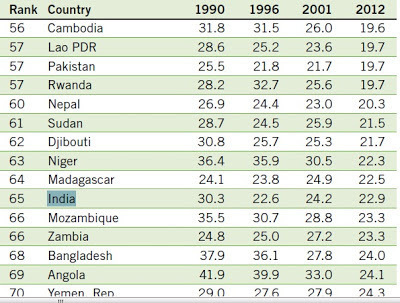 All this put together means that the hunger index for India declined from 24 to 21 between 2003-07 and 2008-12. 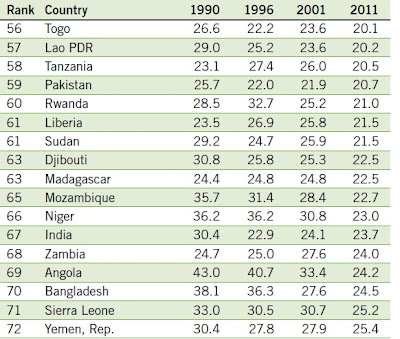 The proportion of underweight children is an estimate done by IFPRI as the last survey was done in 2004-05. In other words, the proportions and the index for India are at best an approximation. Other surveys done more recently have shown trends that indicate that the nutritive value of food consumed per person is dipping. A recent survey of consumer expenditure said that nutritional intake measured in terms of calories declined from 2,153 kilocalories (Kcal) per person per day in 1993-94 to 2,020 in 2009-10 in rural areas and from 2,071 to 1,946 Kcal in urban areas. These shocking results are according to a report of the 66th round of survey done by the National Sample Survey Organisation (NSSO). Even between 2004-05 and 2009-10, the calorie intake per person per day dipped from 2,047 to 2,020 in rural areas and from 2,020 to 1,946 in urban areas. 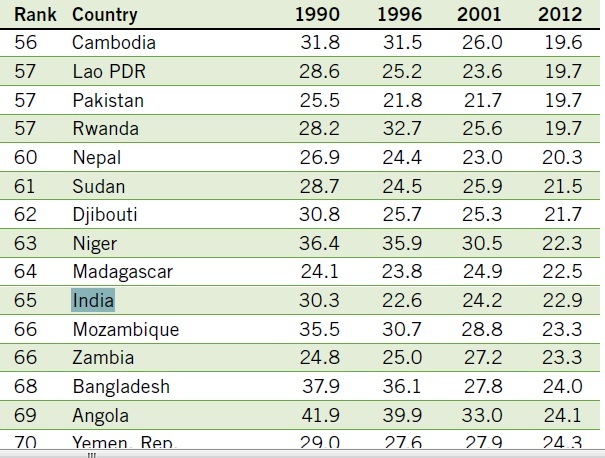 Despite these caveats regarding the GHI data, India still continues in the "Alarming" category of countries classified by severity of hunger. That puts it in the category where the hunger index is between 20 and 29.9. Others in this category are Ethiopia, Sudan, Congo, Chad, Niger, and other African countries. 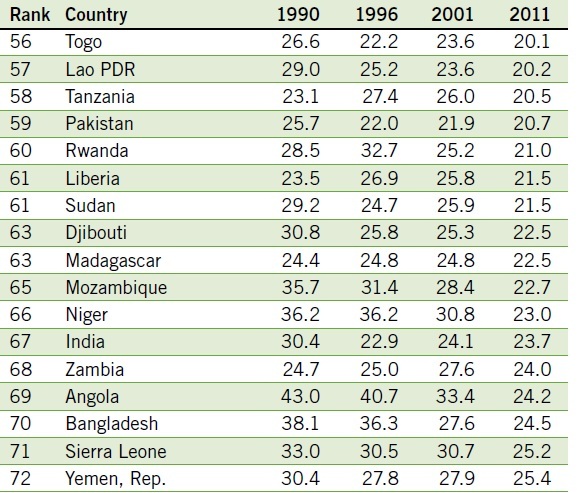 These are places ravaged by resource wars and extreme poverty, and they make up the bottom most bunch in the Human Development Index rankings. Meanwhile, an October report on food prospects issued by FAO forecast a record cereal harvest for 2013 powered by a 7% increase in production over 2012. Wheat output is estimated at 705 million metric tons (MMT), a record. Coarse grains output is put at 1,288 MMT, another record. And rice output is estimated at 496 MMT, yet another record. Wheat prices have declined in international markets by 16% over last year, rice prices are down 23% and maize prices by 35%, according to FAO's price monitor in October quoting prices for September 2013. With huge production and declining prices worldwide, why the world's hungry are not getting enough food is a conundrum that policy makers and experts are groping to answer. The government is in process of preparing a pilot project on National Zero Hunger and Family Farming Programme which would be implemented in most food insecure areas. A specially established National Zero Hunger Cell in Ministry of National Food Security and Research was tasked to prepare the pilot project before launching of larger National Zero Hunger Programme. Official sources on Monday said in order to initiate the process of preparation of the pilot programme, a national mapping exercise was jointly undertaken by World Food Programme (WFP), Food and Agriculture Organization (FAO) and the concerned ministry to gain better understanding of ongoing programmes relating to school feeding, nutrition support, income generation and family farming support. The sources said during the mapping exercise it was agreed that provinces would be taken into confidence before finalization of the programme. The programme will be implemented in most food insecure areas, in each of the four provinces of the country, in coordination with provincial governments. The pilot project will help analyze the effects of the proposed intervention in each province and to incorporate lessons and experiences gathered into a more comprehensive programme. Answering a question regarding levels of hunger and malnutrition in the country, the sources said the last National Nutrition Survey (NNS) was conducted by Aga Khan University’s Division of Women and Child Health, Ministry of Health and United Nations Children’s Fund (UNICEF). Ministry of National Health Services is also planning to conduct a National Nutrition Survey in 2017-18 by which latest information will be available. It is also important to mention that during the last three years in Pakistan food items like wheat, rice, maize, potatoes, onion, mango, citrus; palm dates, milk, meat etc. were produced in surplus as per country requirement.